Welcome back! If you haven't already done so, check out my article from last week here. We've taken a first look at each available Corrupted creature, and formulated some initial reactions. Opinions on cards are subject to change as we progress into the deckbuilding stage. It's important to be open to re-evaluation when our initial results inevitably fall short of expectations. For now, though, we're certain that we want to be playing Water and Nature as our primary colors. Whether we want to splash is going to come down to how well we can execute our gameplan on this two-color axis. We should expect some gaps in our progressions, and we can then identify the appropriate third (or even...gasp...fourth) color after we get a few games in. The first thing that jumps out at me about Bobby's list is how creature-light it is. The deck is playing almost as many spells as creatures! 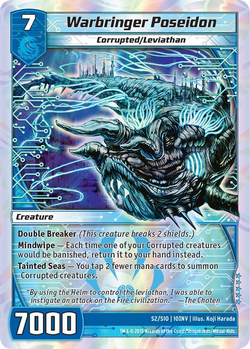 We want to pack the deck with Corrupted creatures to maximize their effectiveness, true, but in lieu of stuffing in as many as possible, Bobby has chosen to only include the most powerful and resilient threats. [ccProd]Vicious Squillace Scourge[/ccProd] is the only Darkness Corrupted creature in the build, and [ccProd]Tricky Turnip[/ccProd] serves as your only 3-drop due to the color configuration he's chosen. To make up for this, Bobby has gone all-in on [ccProd]Warbringer Poseidon[/ccProd] and plays the deck more as a midrange beatdown deck. You'll want to get in for precise swings when the instant gratification is there (i.e. Seneschal and/or [ccProd]Bad Apple[/ccProd], or maybe Renegade giving your team some resiliency to blasts), but you're not really in a position to bullrush the opponent. Full complements of [ccProd]Terror Pit[/ccProd] and [ccProd]Root Trap[/ccProd] give you some answers to larger control creatures, meaning you can sit back a little longer than the Corrupted deck I was envisioning in my head. I can't stress enough how important [ccProd]Warbringer Poseidon[/ccProd] to bringing this whole angle together. Your Nature ramp will help you cast him before turn 7 in most scenarios, and untapping with the Leviathan lets you immediately go on the offensive. If you summon a 2nd Leviathan, virtually all of your other Corrupted creatures become free. If you get a [ccProd]Seneschal, Choten's Lieutenant[/ccProd] or two into play, it's very hard to lose at this point; all your creatures will simply bounce back to your hand, you'll draw into new threats, and you'll be able to slam ALL of them back into play. 8 mana. Tap 5 to summon a second [ccProd]Warbringer Poseidon[/ccProd]. Vomit out a bunch of free guys that you drew into with Lieutenant. Play Vicious Squilly for 1 mana! Your threats just become too much to deal with. Bobby's list is focused on consistency above all else, and I respect it for that. This deck will attempt to do the same thing every single game, and the synergies are very noticeable. I also appreciate the fact that he's only running 9 multicivs, which appeared impossible with this deck at first glance. The question I have is: can we make this more powerful? 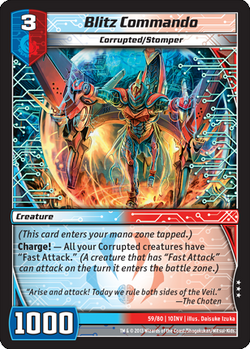 A naked [ccProd]Aqua Trickster[/ccProd] with no turn 3 follow-up is pretty poor, so unless we curve Renegade into Turnip into Apple, this deck might get out to a slow start. It only plays 2 level 3 creatures, and that creature isn't even Corrupted unless we summon [ccProd]Bad Apple[/ccProd]. It's not the worst to summon [ccProd]Seneschal, Choten's Lieutenant[/ccProd] on 4 after a Turnip -- both creatures will have "hexproof" after all -- but the potential for screwing around waiting to draw the right cards is a little higher than I'd like. That said, it has other things it can be doing on those turns -- [ccProd]Sprout[/ccProd], [ccProd]Logos Scan[/ccProd], and [ccProd]Bone Blades[/ccProd] are all sturdy cards in their own right. But those cards aren't letting us accomplish anything that other, more powerful decks can't get over by simply playing their cards. We might be sacrificing consistency, but maybe we can add more than enough explosiveness to make up for it. I want to see what is possible with another civilization besides Darkness. Fire in a non-Dragon, non-rush deck? Surely I jest! Haven't seen that since the ancient times before the release of DragonStrike Infernus. [ccProd]Bottle of Wishes[/ccProd] is retired, though, and I've been dying to include Gilaflame in a midrange deck anyway. Let's go! This is a very "safe" build utilizing these colors, but I think it covers a lot of bases. We're playing enough standalone good cards to stand a chance against most meta decks, but we're also leaning enough on our Corrupted creatures to get a solid read into their relative power levels. 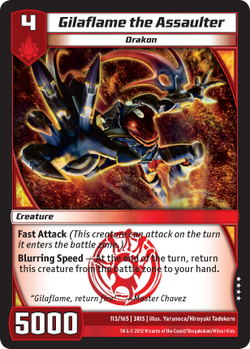 [ccProd]Gilaflame the Assaulter[/ccProd] is just an all-around fantastic Kaijudo card. He fulfills multiple purposes: he's your red [ccProd]Bone Blades[/ccProd], your much-needed mono-civ mana, and a random game-ender all in one. He's not your ideal 4 drop by any stretch of the imagination, but when the game goes long, there aren't many (non-Dragon) Fire cards I'd rather topdeck than Gilly. Bottle is gone, so feel free to poke your opponent's eyes out with impunity. We haven't lost out on any of the ramp elements from Bobby's version, and we've kept the multiciv count down to a tight 9 cards. Our shield blasts are noticeably worse, but I think the deck can get by without Pit and [ccProd]Bone Blades[/ccProd]. I have a feeling [ccProd]Bone Blades[/ccProd] is going to find itself being continually squeezed in the coming months. It's still the most efficient 4 mana you can spend to kill a wide range of creatures, but sometimes it just isn't fast enough and only has value as a blast. Megabug curves with [ccProd]Cyber Scamp[/ccProd], [ccProd]Tricky Turnip[/ccProd], and [ccProd]Keeper of Laws[/ccProd] laugh at [ccProd]Bone Blades[/ccProd]. It's a little too late against Dragons if you're on the draw and they summon [ccProd]Nix[/ccProd] on 3. You also don't really want it in the Corrupted mirror, if that becomes a thing. [ccProd]Tornado Flame[/ccProd] does the same job just fine in the blast department, and while you don't really want to hardcast it, it IS nice to be able to take out [ccProd]Herald of Infernus[/ccProd] or [ccProd]Lost Patrol[/ccProd] in a pinch. Some might argue for something like [ccProd]Drill Storm[/ccProd] in its place, but [ccProd]Tornado Flame[/ccProd] is sturdier. The red is an afterthought in this deck, so Flame's just a [ccProd]Mountain[/ccProd] that can randomly fill in as your missing copies of [ccProd]Bone Blades[/ccProd] in my mind. In addition to the shield blast drop off, we're missing out on the raw power of [ccProd]Vicious Squillace Scourge[/ccProd] in this version. There's no doubt he's a game ender, but the low number of level 3 or lower creatures in Bobby's version makes his cost a little more prohibitive than I'd like. If we're not going to be coming in on shields until we stick a [ccProd]Warbringer Poseidon[/ccProd], then Squills is a weak draw for most of the game. In the late game when you want to see him, you might not be able to accept the tempo loss of an Evolution creature. [ccProd]Blitz Commando[/ccProd] fills the aggressive void for us. He's much easier and cheaper to cast (especially in coordination with the Warbringer), and he can end games before control decks are able to get a foodhold. He also has a lot of value in the early game. Say you're on the play and you hit [ccProd]Bronze-Arm Renegade[/ccProd] into [ccProd]Blitz Commando[/ccProd] and your opponent doesn't play a level 2 blocker. Attacking with the Renegade and the Commando on turn 3 can be devastating. Imagine if you dodge shield blasts -- you're now threatening a fast attacking Seneschal that will shield all your creatures and replenish your hand. Your opponent is forced to kill your creatures so they don't die, and the Commando will be a higher priority target than the Renegade. Now, you're ramping up to [ccProd]Warbringer Poseidon[/ccProd] and [ccProd]General Finbarr[/ccProd]. I love decks that can change roles on a dime and put the opponent in lose-lose positions, and this deck thrives on those kinds of plays. [ccProd]Blitz Commando[/ccProd] also makes up for our lack of [ccProd]Terror Pit[/ccProd], in a way. If our opponent is trying to systematically break our shields, we may not have hard removal at our disposal, but we probably have a bunch of little Corrupted creatures in said shields. We have the potential to either kill the opponent out of hand or draw a bunch of unforseen cards with things like Gilaflame, Commando, Seneschal, and Finbarr in the mix. Speaking of [ccProd]General Finbarr[/ccProd], I couldn't resist adding the full set. He's not a Corrupted creature, but you need someone to plug the hole between your level 4s and Poseidon. I honestly can't imagine playing any blue deck that wants to attack and not playing Finbarr. If you're trying to go under the control decks, he does everything you need him to do and more. He's an extremely fair but powerful standalone threat. Having Finbarr out alongside Lieutenant Seneschal is a sure recipe for a win. I'm happy with this (admittedly vanilla) version of RUG Corrupted on paper, but we need to take it for a test drive. Come back next week for the final installment in the Cracking the Corruption series where I pit this build against an existing meta deck, and then go over the strengths and weaknesses. Hopefully we'll confirm that the deck has a solid core, while identifying some shortcomings that can be addressed. If you have any suggestions for the deck I posted above, be sure to comment below! Don't miss out when the Circuit Series comes to Worcester, MA this weekend! The Sunday Kaijudo Main Event is awarding over $500 in prizes, and everyone who enters gets a signed [ccProd]Sparkblade Protector[/ccProd] signed by Drew Nolosco! I can't wait to see how Invasion Earth impacts this event! to be a game changer in constructed play. Zach, great article! I really like your inclusion of Blitz Commando in your deck. His ability to give other creatures fast attack really puts your opponent on alert, especially those who favor control decks. His ability makes up for his smaller power. Awesome addition! It will prove to be a game changer in constructed play.